Cinderella went to the ball in a pumpkin coach. Laurence of Arabia rode across the desert in a camel. ﻿Mushers and their teams race from Anchorage to Nome with sled dogs. Getting there is surely more than half the fun? 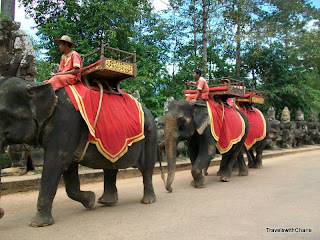 In Siem Reap you have the option to ride an elephant around the Angkor complex for what could be an elevated experience. I also love the orange throw over the back of the elephant for that royal touch! The procession of tuk tuks above bodes well for independent travelers to Cambodia who wish to move about without the restraining expense of a chauffeur driven limo. The jeepney was fabricated from used jeeps left by the Americans in the Philippines at the end of World War II. The most colorful and extravagantly decorated jeepneys ply the roads in Metro Manila. What I like about riding the jeepney is the flexibility of getting off where I please by just asking the driver, "mama, para po dito" (Mister, please stop here).